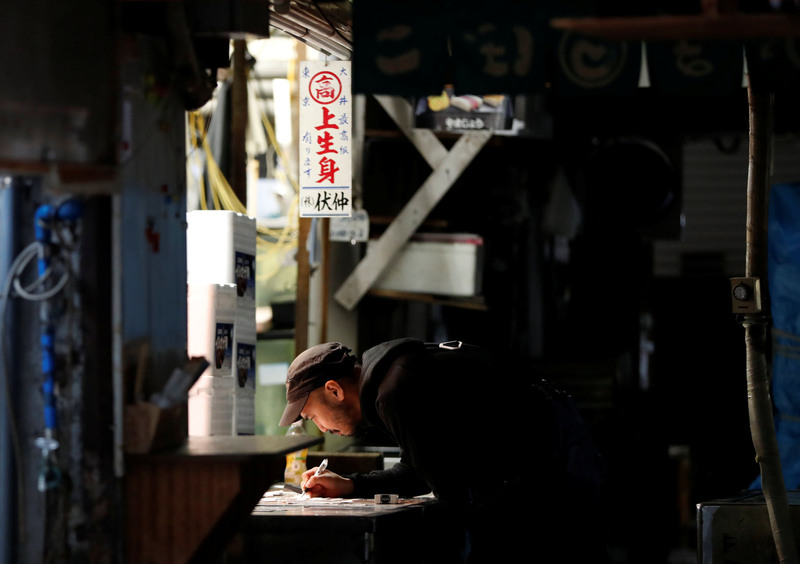 Old-fashioned and full of nostalgia, the renowned Tsukiji fish market is at its busiest before dawn. Hand-written signs by small-fish wholesalers are lit with white lamps in the otherwise dark corridors of the market as workers prepare for the morning’s main event: the tuna auction. Hundreds of massive tuna are laid out on the floor as wholesale buyers size up the most prized catches ahead of the auction’s 5:30 a.m. start time. Transactions are still conducted via a flurry of hand signals, a hand bell and coarse, rhythmic chants from buyers desperate to land a bargain for their customers. But these scenes will soon be gone for good. The open-air, 83-year-old market in Chuo Ward is showing its age. There’s no air conditioning available at the single-story market — an issue that’s particularly problematic and potentially unsanitary in the midst of Japan’s hot, humid summers. Instead, fish merchants use tons of crushed ice every day to keep seafood fresh for thousands of customers. Space has also become an issue. Sellers often run out of room in their shops and have to temporarily store their produce outdoors, while roads leading into and out of the market are regularly congested with trucks coming and going. Citing those reasons and its plans to build roads and other facilities for the Olympics and Paralympics, the Tokyo Metropolitan Government will shut down the 23-hectare market on Saturday. About 550 fish wholesale businesses and 100 vegetable traders operate at the Tsukiji market, along with 14,000 workers and 28,000 visiting buyers. They have all been asked to relocate to a new, ultramodern facility in the Toyosu district, about 2 km south. The new multistory, air-conditioned buildings will open on Oct. 11. Tsukiji officially opened on Feb. 11, 1935, but to understand the origins of the market one may need to go back much further than that, to the death of samurai warlord Oda Nobunaga on June 2, 1582, at Honnoji Temple in Kyoto, a landmark event that changed the course of Japanese history. In the 16th century, the country was divided and ruled by a number of samurai warlords. Nobunaga, a cruel samurai hegemon, had conquered most of the warring states and was about to realize his long-held goal of unifying Japan. Instead he was betrayed and ambushed by vassal Akechi Mitsuhide while sleeping at the temple. Realizing that an escape was impossible, Nobunaga set fire to the temple and killed himself. Tokugawa Ieyasu, another vassal of Nobunaga’s, was staying in Sakai, in what’s now Osaka Prefecture, at the time. Upon learning of the death of his master, Ieyasu embarked on a desperate journey to escape from Akechi’s troops and go back to his homeland in what’s now Aichi Prefecture. Legend has it that some local fishermen in nearby Tsukuda, now a district of Osaka, offered to safely ferry Ieyasu across a river to help him go back to his hometown. Ieyasu, who would go on to establish the Tokugawa shogunate in 1603, deeply thanked the fishermen and gave them special fishing rights in the bay near Edo — later renamed Tokyo — when they moved to the city from Osaka. According to legend, those fishermen, while regularly offering their fish to the shogunate, started selling their excess catch out of Edo’s Nihonbashi district around 1600. The marketplace, known as Uogashi (meaning fish river bank), would evolve into the nation’s largest fish market. After much of the city was destroyed by the Great Kanto Earthquake in 1923, it was relocated to the Tsukiji district in 1935. Some say the origin story of the fishermen may be an urban legend made up by later generations to entertain people or justify the special fishing rights given to certain fishermen by the Tokugawa shogunate. Wherever the truth lies, the fact remains that the Nihonbashi market grew in lockstep with Edo’s peace and prosperity under the 264-year rule of the Tokugawa shogunate. The population topped 1 million and became the world’s largest city by the late 18th century. Fish — both cooked and raw — became a staple of the local diet. Modern-day sushi was invented and refined during the Edo Period (1603-1868) and the Nihonbashi market served as a hub for the city’s seafood lovers. During the Meiji Era (1868-1912), when Japan began to modernize through the introduction of Western technologies and customs, Nihonbashi and its surrounding areas developed into a thriving business center with many banks and department stores. The Bank of Japan is still located in the district. The Uogashi fish market in Nihonbashi, meanwhile, did not have any covered facilities, and fish were sold out in the open on the streets. The Tokyo government repeatedly drew up plans to relocate the fishermen-run market to somewhere else in Tokyo, citing sanitary concerns. Soaring prices were another reason the city tried to build a public wholesale market to regulate fish and fresh food transactions. But the city failed with each effort, partly because of opposition from fishmongers with vested interest in the Nihonbashi market. That changed with the devastating 7.9 magnitude quake on Sept. 1, 1923, and ensuing fires that left much of the city in ruins, including the Nihonbashi district. The fish market burned to the ground and nothing was left but two metal cash boxes. 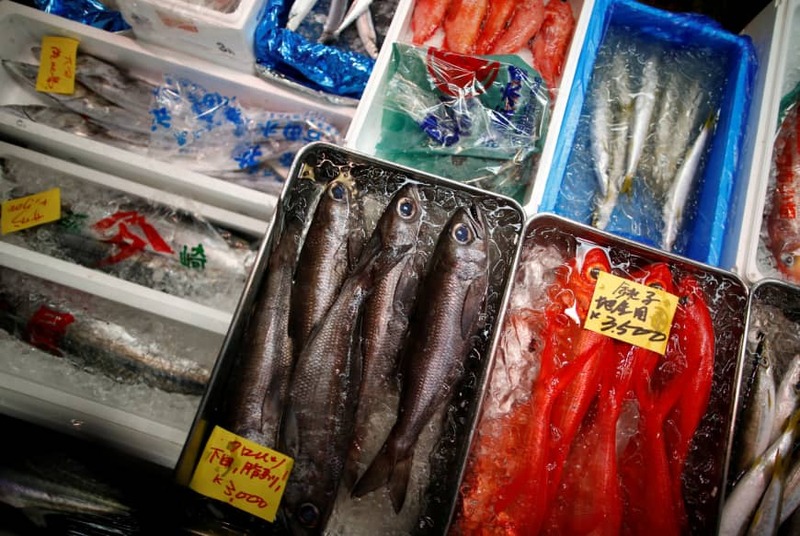 The city quickly banned fish dealers from resuming business at the Nihonbashi site and drew up a plan to build a new market in the Tsukiji area. The relocation plan was one of the biggest reconstruction projects in Tokyo in the wake of the 1923 earthquake. The Tsukiji market and its facilities were constructed over six years and a total of 419,500 workers were mobilized. Special freight railway tracks led to the compound so that trains could directly transport tons of seafood, vegetables and fruit directly into the market every day. 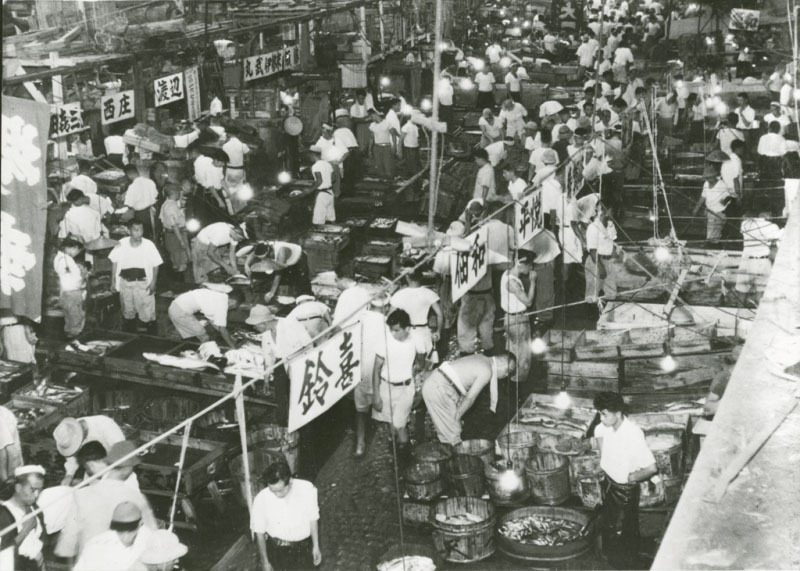 After the opening of the Tsukiji market, some old hands lamented that the culture and traditions of the Nihonbashi market were lost as merchants were forced to move to a modern public market operated by the city, rather than by fishmongers. Dealers at the Nihonbashi market had formed exclusive guild-like communities that had maintained many century-old business customs for its membership. Men working there were also seen as typical Edokko, or those born and raised in Tokyo. Edokko are known for being short-tempered, straightforward, and quick to pick a fight, yet warmhearted deep down. Despite the disappearance of the Nihonbashi market, some of those traits were handed down to workers at the Tsukiji market. “They were short-tempered and some would drink sake while working. They treated people from the outside as strangers,” said Suwa, now the managing director of his family’s shop, Suwa Shoten. 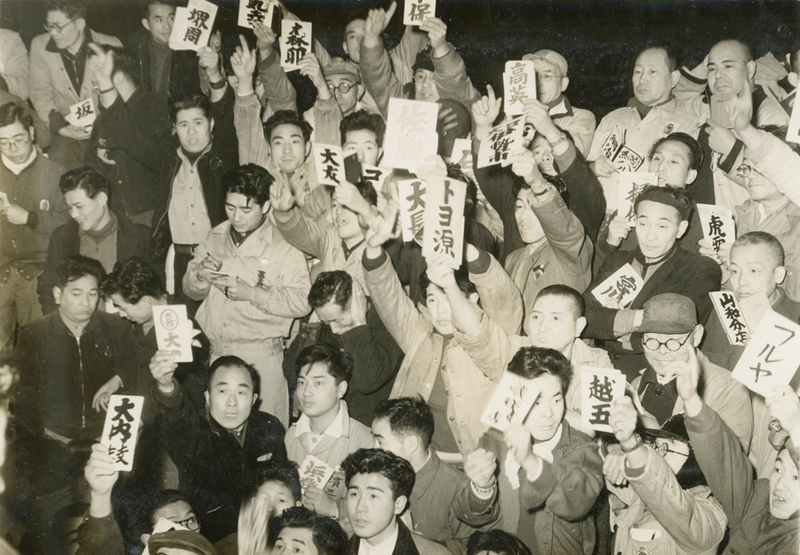 “Generations have changed and workers have become much softer,” Suwa said, adding it was unimaginable that the fish market would some day become a popular tourist attraction. Suwa Shoten, which opened around 1929, is among about 300 shops located next to the main market. The area is known as the Outer Tsukiji Market and is also popular with tourists. Today, many shops of the outer market sell takeout snacks to visitors and sushi restaurants fill up regularly. Every day, streets in the area are packed with hundreds of sightseers. As recently as 10 years ago, the outer market was very quiet, as shops there were all those of wholesalers specializing in certain products for professionals coming to the inner market, such as cooking goods, pickles and dried seafood, Suwa said. Such customers come in the wee hours of the morning, before their businesses open for the day. “Around noon, most shops were already closed and it was very quiet in the afternoon and at night. Now you can see many sushi restaurants here, but there was only one or two around that time,” he said. The situation was the same for some shops and eateries in the inner market, too. Their main customers were food professionals and those working at the wholesale market, not tourists. Japanese foodies craving the freshest sushi eventually discovered the high quality of small eateries inside the market. Word-of-mouth then spread to foreign tourists, who often arrive at Haneda airport late at night or early in the morning and are looking for a place to visit before they can check into their hotels. The number of inbound tourists to Japan also began to surge. 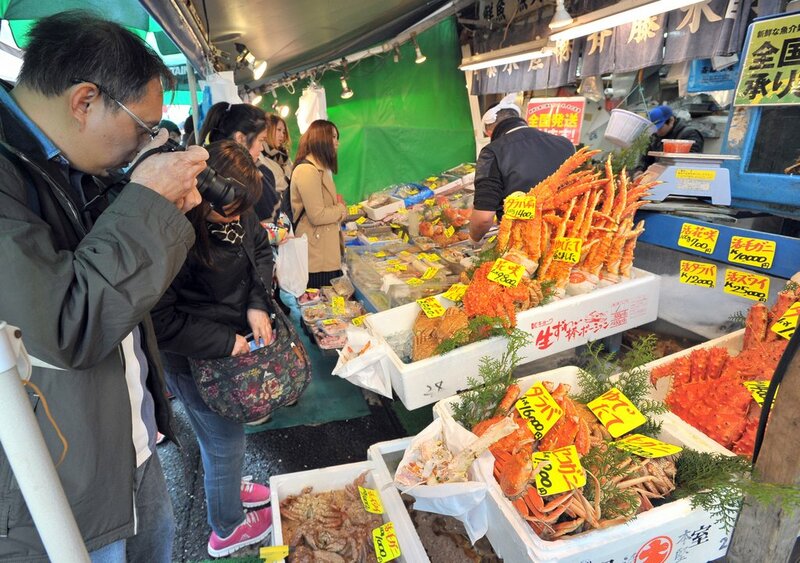 Foreign tourists to Japan more than quadrupled from 6.79 million in 2009 to 28.69 million in 2017, bringing a flood of visitors seeking fresh seafood to Tsukiji. “The atmosphere of the outer Tsukiji market has totally changed over the years,” said Mayumi Ogawa, a 60-year-old freelance multilingual interpreter born and raised in the vicinity of the market. When she was a child, all the shops in the outer market were family-run wholesale businesses. They mostly sold goods for regulars and shop owners had a strong community bond, Ogawa said. Customers coming into shops all wore rain boots because they needed to walk around the inner fish market, too. Fish traders there used seawater to clean the floor and equipment. Few people visited the market for leisure, Ogawa said. At Suwa Shoten, where wholesale used to make up 100 percent of its revenue, retail now accounts for 80 to 90 percent of sales. The multilingual Ogawa has written the English- and Chinese-language pages of a website run by a local community group promoting the outer Tsukiji market. She also helps shops serve foreign visitors who seek to buy traditional Japanese foods. Asked about the changing environment of the Tsukiji area, she said some of the market’s traditions will definitely be maintained at the Toyosu market because hundreds of fish traders will make the move. At the same time, she said many businesses in the outer market fear shoppers and tourists may stop coming to Tsukiji once the main fish market closes. 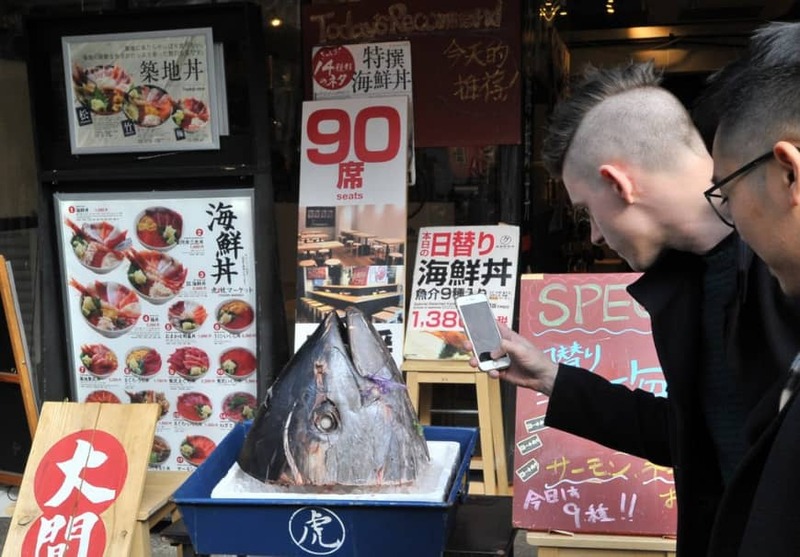 “For many, the main purpose of coming to Tsukiji was to visit the (inner) fish market,” Ogawa said. Contrary to popular belief among Japanese and foreign visitors, most shops of the Outer Tsukiji Market will remain, she noted. So the outer market business community is now trying to get the word out that they will be staying put. Some shops may even extend their business hours to attract more tourists, Ogawa added. Fusao Noguchi at the Tsukiji Information Center is also worried about the closure of the inner market. His company has organized guided tours around Tsukiji, including some with English interpretation for foreign visitors. The new Toyosu market will still allow a number of tourists to watch the famous tuna auctions. But visitors will be limited to certain areas and will only be able to view the auction from an observation deck or second-floor corridors separated from the wholesale floor by glass walls. “I don’t think Toyosu will be a popular tourist destination like Tsukji,” he said. The Tokyo Metropolitan Government will soon begin dismantling the Tsukiji market and start construction for the 2020 Games. But the governor has yet to reveal any specific plans, leaving the future of decades-old Tsukiji, once the pride of the Tokyo mayor and with an origin story that may date back centuries more, up in the air. Often the name of a place tells a lot about its origins. In the case of Tsukiji, a name synonymous with the world’s largest fish market, the name consists of two kanji — tsuki meaning construct, and ji meaning ground — an appropriate title given the market was built on reclaimed land. In fact, until about 360 years ago, there was no place called Tsukiji in Edo, today’s Tokyo. In January 1657, a huge fire broke out and engulfed much of the city. The fire burned down 60 percent of Edo, killing an estimated 100,000 people and destroying Edo Castle in the heart of the city. The fire also destroyed a branch temple of Nishi Honganji, part of the powerful Jodoshinshu Buddhist school in the Nihonbashi district. The Tokugawa shogunate therefore allowed followers of the branch temple to reclaim waters off the Hatchobori district in eastern Edo and rebuild the structure there in 1679. This is the origin of the Tsukiji district in today’s Chuo Ward. During the Edo Period (1603-1868), much of the area was occupied by the temple and houses of samurai warlords staying in the city. In 1857, the shogunate opened a naval school there to train crews to operate a modern Western-style ship. From 1868 to 1899, some of the Tsukiji area was designated a foreign settlement, where only foreign merchants and diplomats were allowed to live via extraterritorial rights.